Enthusiastic high school students attend LAU’s summer Arabic creative writing camp. In addition to developing and enhancing the skills required in writing short stories, the students learned about growing trends in Arabic literature. “My teachers at school always told me that my Arabic wasn’t very strong, but Ms. Iman told me that the stories I wrote this week were good and through this workshop I have gained valuable experience and confidence,” said Yasmina Al Abd. 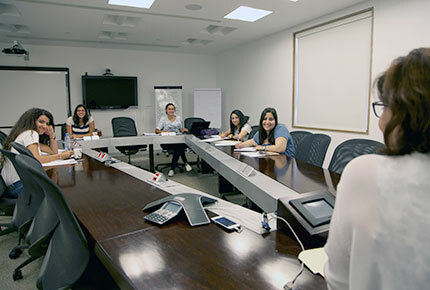 She was one of the high school students recently who recently attended a five-day intensive Arabic creative writing course at LAU conducted by Lebanese novelist Iman Humaydan. “Yasmina doesn’t use clichés, she has her own strong style. I think that’s why they didn’t encourage her. Teaching institutes here often don’t appreciate unique creativity,” said Humaydan. A panel of judges who reviewed the students’ stories at the end of the week agreed and awarded Al Abd a scholarship to study Arabic at LAU. In addition to strengthening their skills in character development, opening lines and writing short stories, the students learned how and when to incorporate dialect into writing, a growing trend in Arabic literature. “I discovered modern Arabic writing. We are always presented with the classical at school, but this way I could learn some modern approaches without using clichés,” said high school student Majida Tabar. Humaydan was very pleased with the productivity and attitude of her trainees. She was particularly gratified by their pleasure in writing in Arabic. “We must rebuild a strong natural relationship between Arab youth and their language. This is fundamental. There is something broken in the connection,” she says, referring to the specificity of regional regimes, attitudes toward the West, religion and a lack of productivity as perpetrators of this disconnect.